+ 3 = 10 Required Please enter the correct value. Many investments have a stake in the outcome of election 2016, although some more than others. In particular, we've found several "Cuba investments" — companies and mutual funds with exposure to the Pearl of the Antilles — that could be impacted negatively if Donald Trump wins on Nov. 8. While some companies might actually benefit from a Trump presidency, these have the most to lose because of their dealings in Cuba. On Sept. 16, Trump said he will reverse current diplomatic and trade agreements with Cuba unless it restores political freedoms. 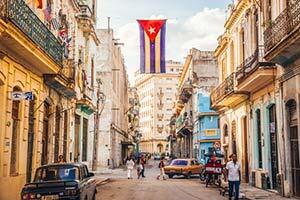 While many Cuban immigrants in the United States would rejoice at such a policy, closing off trade with Cuba could badly impact certain investments — namely companies that have ties to Cuba. Trump added that his demands will also include religious freedom and the freeing of political prisoners. The deal Trump said he will reverse refers to the landmark agreement President Obama made with Cuba on July 1, 2015. The United States and Cuba fully restored diplomatic relations and opened trade talks – something that hadn't been feasible after Cold War tensions more than 50 years ago. Don't Miss: Why Is Cuban Debt Being Ignored? Officially, the U.S. trade embargo on Cuba is still intact, but President Obama loosened a series of regulations to allow U.S. companies to export to Cuba. After the deal was announced, the stocks of several companies benefited from their current exposure to Cuba or newly announced ties with the island country. For example, Royal Caribbean Cruises (NYSE: RCL) jumped from $69.11 per share on July 1 to $72.99 on July 12. And Starwood Hotels & Resorts Worldwide Inc. (NYSE: HOT) hit its 52-week high of $84.37 in March after it announced new hotel deals in Cuba. In 2014, about 160,000 Americans traveled to Cuba. This year, that number is expected to exceed 300,000, according to Investopedia. But those numbers could dwindle if relations between the two countries turn sour. The hospitality industry, too, could pay a price for severed U.S.-Cuban relations. For example, Starwood Hotels announced back in March it's planning on building three hotels in Cuba – something not seen since the Cuban Revolution nearly 60 years ago. A tiny $38 million mutual fund called Herzfeld Caribbean Basin Fund Inc. (Nasdaq: CUBA) has a lot to gain from exposure to Cuba. The fund invests in equities of public and private companies, particularly those who trade on a stock exchange in the Caribbean Basin country. CUBA targets various sectors, such as banking and finance, food, beverages, and tobacco. Currently, CUBA trades at $6.28 per share. The fund hit its 52-week high of $8.49 back when President Obama visited Havana in March. Not many people are currently trading the fund right now – understandably. Its average volume over the past three months is about 19,000.